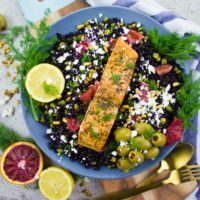 Make the most of blood orange season and infuse it in this Blood Orange Salmon Salad with Orange Dill Dressing served over black rice! 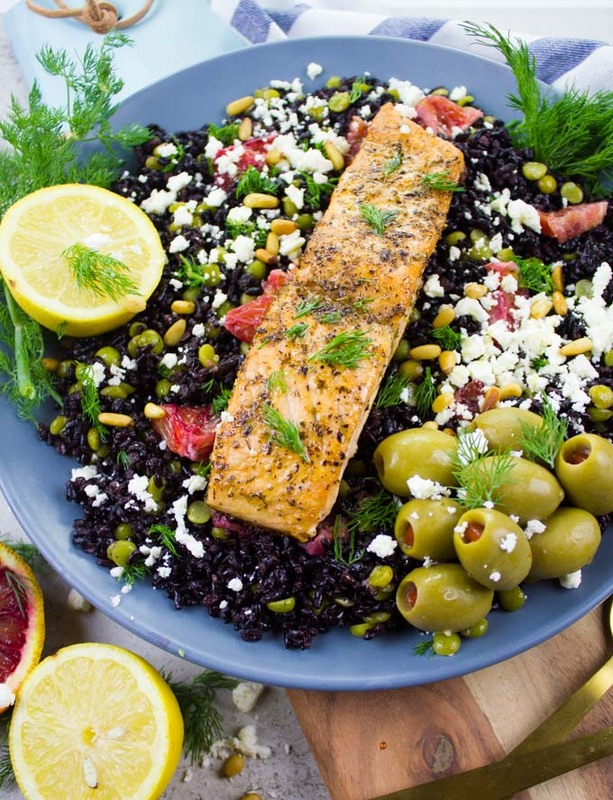 This big salmon salad plate is hearty, filling, good for you and seriously delicious!! Every bite is burst of flavors and textures. I’ve cooked the salmon over the stove, but you can certainly throw it on the grill too! 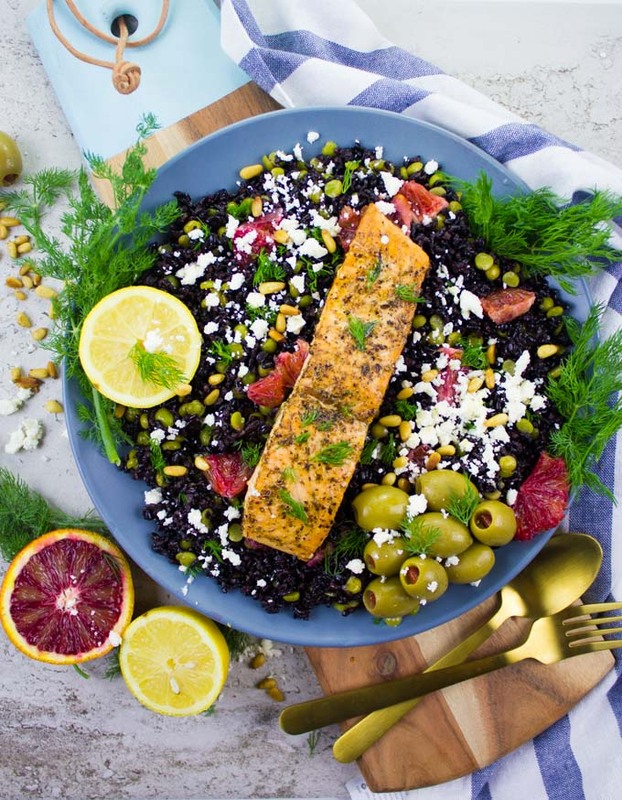 Black rice is cooked with green split peas for extra protein and fibre and the zesty fresh orange dressing takes the salad to a whole new level! Well hello Spring! Actually I wish I said this with a bit more confidence. We’ve had snow a weekend ago. YES. Snow. You know how I’ve promised myself to stop whining about the weather, I’ll probably break that promise now. I’ve seriously put the heavy jackets away, snow pants, mittens etc for the kids. And I was super excited that I won’t have another snow pants struggle day. However I did. Today was like one of those, where’s that other pair of mitten and hat, put this layer over that, zipper all the way up..It just put me down. Luckily the one thing I can control is what I’m cooking no matter what the weather is! lol On the bright side, I love how winter brings the best of what citrus fruits can offer! If you’ve been following me on Instagram (let’s connect!! ), I’ve posted such a fun citrus event I attended. Blood oranges have captured my heart ever since. Another thing I love about this salmon salad is it can easily be served warm, hot or cold. And that’s because I’ve made it with black rice. Have you had black rice before? I probably shied away from black rice because I’m not such a rice person in general. If I had to chose a carb to live on, it would be bread. Pasta and potatoes would be second place and third place would be rice. My brother for example puts rice first. My sister would pick pasta first. So what I’m trying to say is, you certainly don’t need to be a die hard rice lover to make this recipe! I’ve found black rice to have a better texture and taste than regular rice. And likewise I’ve found it to taste better when cold, however white rice when cold isn’t as appealing. The way I cook black rice is by sauteing it in some butter or olive oil, adding water and lowering the heat until it’s all absorbed. For today, I’ve added split green peas and cooked them both together. While the split green peas can be cooked separately, cooking them together impacts maximum flavor and convenience lol. Similarly the salmon. It can be broiled like this Salmon Asparagus Sweet Potato Niçoise–another Spring favorite! Salmon can also be baked, like this Baked Salmon with Greek Dressing–perfect all year long! You can also absolutely grill the salmon, like these Grilled Salmon Power Blend Nourish Bowls–super refreshing for summers. And finally you can sear the salmon, like this Seared Salmon with Blue Cheese recipe–as unusual as this combo sounds, as delicious as it turned out to be! 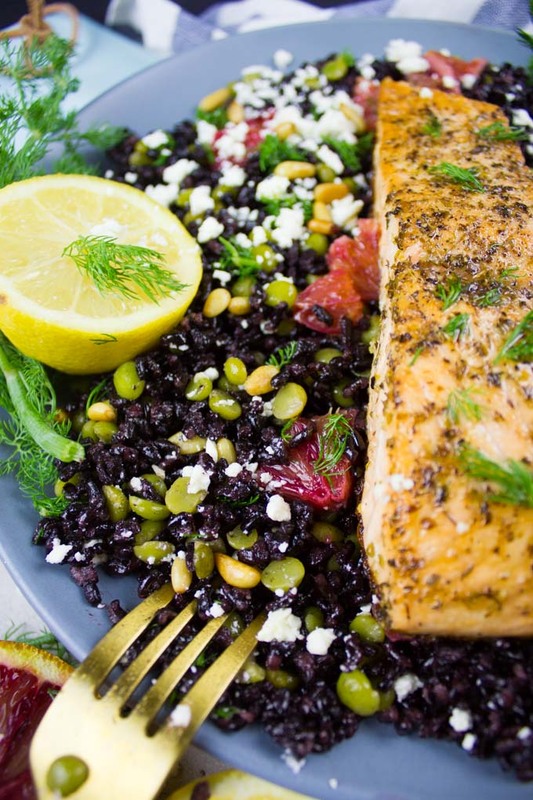 pick your favorite way of cooking salmon and use it here! I seared my salmon today and seasoned it with just salt, pepper, oregano, garlic powder and olive oil. Once the salmon was done, I drizzled some of my orange dill dressing over it. This is a super cool tip I use A LOT for flavoring my meats and fish. As soon as my salmon was cooked and while it’s still really hot, I drizzle it with a dressing or marinade like sauce. It absorbs so much of it since the pores of the salmon are still open. If you let the salmon cool down, these pores seal and it becomes hard to infuse any flavors all the way through. Ok now it’s finally time for the dressing! Blood orange takes the dressing to a whole new level, like when recipes call for a secret ingredient. This is the secret ingredient. They’re sweet with a tang that’s complimented with a berry flavor. I loved the combo of that with dill for my dressing. It’s like a breath of fresh air, a Spring breeze, a total load of deliciousness!! I feel the dressing made this whole salad pop with flavor, not just the salmon. I urge you to make it as is, taste it and then check if you probably want to add a pinch of this or swap an herb for the other. Make this load of salmon salad goodness and enjoy!! 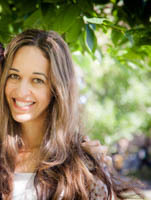 :) And don’t forget to tag me so I can check out your yummy salmon salad creations too! 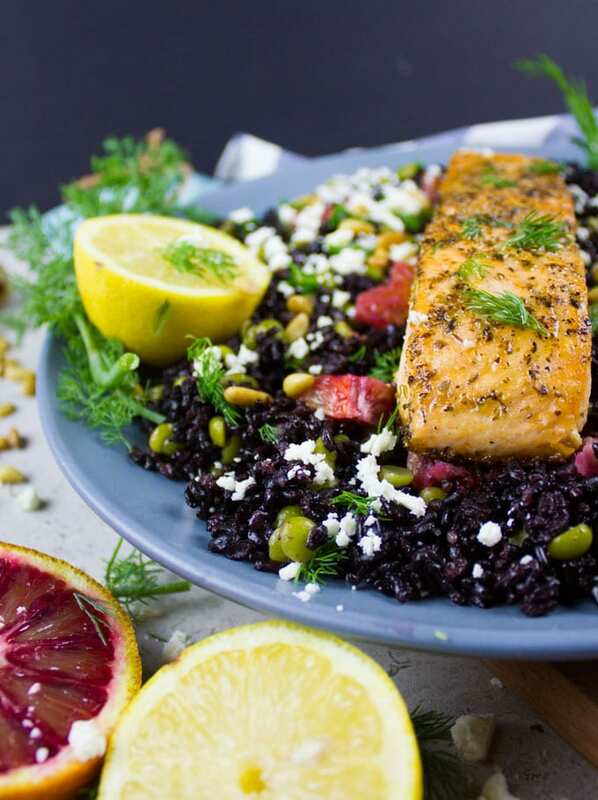 Make the most of blood orange season and infuse it in this Blood Orange Salmon Salad with Orange Dill Dressing served over black rice! This big salmon salad plate is hearty, filling, good for you and seriously delicious!! Every bite is burst of flavors and textures. I've cooked the salmon over the stove, but you can certainly throw it on the grill too! 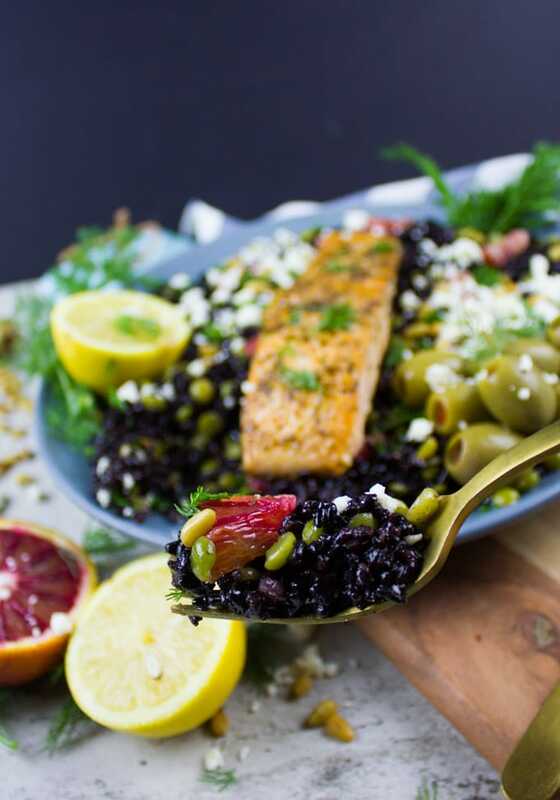 Black rice is cooked with green split peas for extra protein and fibre and the zesty fresh orange dressing takes the salad to a whole new level! Make the rice: Heat the butter in a 3-4 quart pot over medium high heat. When the butter melts, add in the rice and peas and sautee for a minute. Season with the salt, add the liquid of your choice and let that come to a boil. Once it starts to boil, drop the heat to the lowest setting, cover the pot and let the rice and peas cook for 30-45 minutes until all liquid is absorbed. In the meantime, make the dressing by mixing all ingredients in a small bowl or in a container. For the salmon, preheat a skillet over medium high heat. Season the fillets on both sides with the salt, pepper, oregano and garlic powder. Add olive oil to the skillet and add in the salmon fillets. Sear the salmon for 2 minutes on each side, then lower the heat to low and cover the skillet. Use a lid or foil if you don't have a lid for your skillet. Let the salmon cook all the way through for an extra 5-8 minutes (depending how well you like your salmon to be cooked). Once the salmon is cooked, drizzle about half a teaspoon of the dressing over each fillet. Assemble the salad: Toss the rice and peas with 2 tablespoons of the dressing and divide that between four plates. Add the blood orange segments, feta and pine nuts to the rice and toss slightly. Put a fillet of salmon over each plate of rice and drizzle more of the dressing over the salad. I love all the colors in this meal! I love black rice ten times more than regular rice for some odd reason! This looks just all kinds of amazing! I love everything about it! 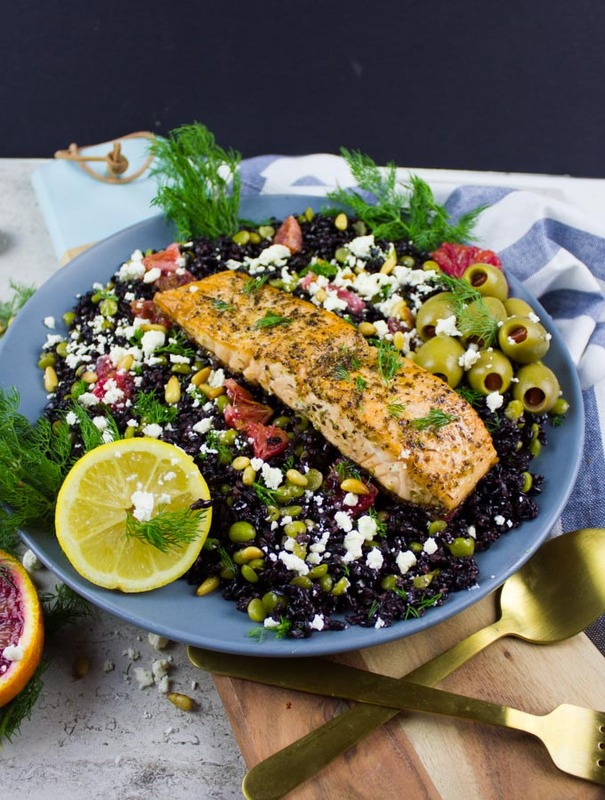 Salmon, citrus, black rice… reminds me of a favorite salad I used to have at the restaurant next to my old job, so happy I can now make something similar at home! Thank you! Salmon and dill are a match made in heaven. I love how simple and easy this is to make, plus healthy, nutritious and flavorful. I gotta try this one soon. Yes Veena, couldn’t agree more! Now that is the type of salad I would order when I’m at a restaurant. It looks full of flavor and nutrition. Besides all the good for you quality, it looks beautiful. I’ve been looking for blood oranges at the store and haven’t seen them yet. The minute I do I’ll buy some and make this salad. Marisa, I’ve seen blood oranges everywhere since last week, and I’m so in LOVE with them! I am loving this salad! This looks for fresh and filling! I can’t wait to give this a try! I love salmon and just bought a bag a blood oranges. This beautiful recipe for blood-orange-salmon salad is so refreshing! After the indulgent holiday months it’s wonderful to focus on healthier dinner options. Thank you so much for sharing this nutritious meal. I can hardly wait to make it! hahaha denay, we’re all on the same boat! The color is this salad, oh my. I also like that you paired it with black rice. So different from the usual accompaniments. Thanks Gene, do you like black rice too?